A RARE FIND! Search for yourself. Shampoo that is 100% natural. 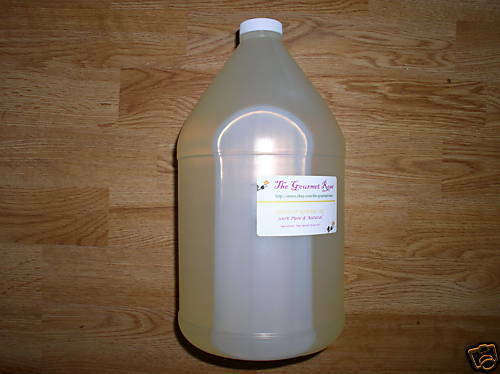 1 GALLON 100% ALL NATURAL UNSCENTED LIQUID SHAMPOO (accepts your own essential oils or fragrances) ENOUGH TO FILL 16 (8 OZ) BOTTLES FOR RESALE! Our liquid shampoo is 100% Natural. There are NO sulfates /detergents /surfactants in our product. Liquid glycerin shampoo is mild to the scalp and hair and is a powerful cleaner. Bottle as your own spa's custom line or perfect for beauty salons, etc. Readily accepts fragrance and essential oils. This product is also perfect for a natural shower gel, body wash, hand soap, dishwashing soap (by hand), laundry soap, and even the best dog and pet shampoo too! Ingredients: Ingredients: Saponified vegetable oil of Coconut oil and Olive Oil, Purified Water , Vegetable Glycerine , Oleic Acid . No DETERGENTS No SURFACTANTS No SULFATES No Chemicals No Colors or Dyes No Perfumes or Scents No SUGAR SOLUTIONS No ALCOHOL SOLUTIONS NO SLS OR SLES NO foul smell Yes 100% Soap Yes, Vegan Yes, All-Natural Yes, 100% Vegetable Soap Yes, Hypo-Allergenic Soap base is Non-Comedogenic Yes, Biodegradable Yes, Soap base is great with additional oils, herbs, essential oils.